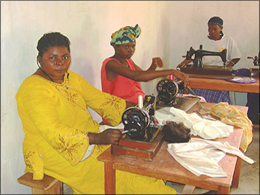 This centre is flourishing, and the women are working hard showing the skills they are learning by producing clothing, bed covers in both crochet and patchwork, cloth bags and much more. 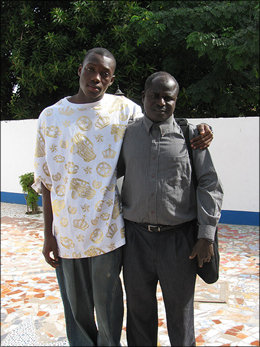 Lamin is still assisting with the training, and continues to manage the stores. We have a lot of supplies in the storeroom, but we can always do with more hand sewing machines in good working order that use the round bobbins (not shuttle), sewing needles (hand and machine), scissors and crochet hooks. We have purchased more plastic containers for the supplies we have recently shipped out, and pictures of the ladies working have been put up on the walls. We are going to convert half of one of the storerooms and make it self-contained to install a community library. 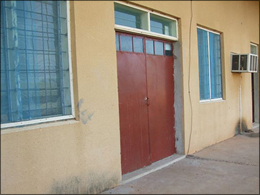 There are community meetings held in one of the Centre’s rooms, so the building is well used, and as it is placed in the centre of the village, it is convenient for everyone. All the schools we support have been sent provisions, and we continue to have 35 sponsored students and 6 sponsored teachers. We started a rice program earlier this year to ensure that the children receive a midday meal. Crops of tomatoes, sorrel, onions and bananas are grown in the school garden to supplement the rice. We have two ladies from the village who are the school cooks, in return they receive rice for their children in payment for their work. Providing this midday meal has also increased the number of children coming to the school, as they know they will be fed! We have been allocated an area in the rice fields for helping to supply rice to the school. This was suggested and provided by the Village Development Committee in Si-Kunda, and will be a great help. We have made some recent changes at the school, and hope these changes will improve and provide better facilities for the children. We have done an inventory of supplies, and have had a major sorting out of them and lots of discussions of how to progress. We are setting up a PTA, which is welcomed be everyone concerned. Some refurbishment needs to be done, so we are in the process of getting that organised. 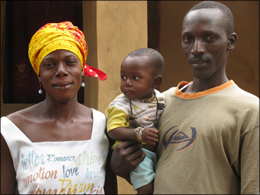 The photograph above is of Modou our Deputy Head teacher at the school with his wife Mbowho, and 7month old son, also called Modou. 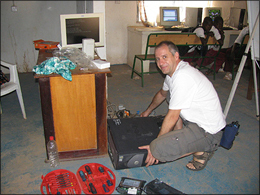 Stationary supplies have been delivered to the school, and on our recent visit Richard spent time in the computer lab doing some much needed maintenance. The server had to be rebuilt as did a couple of the pc’s. And then various other bits and pieces needed doing including replacing all the mice, replacing some cables and updating the links of all the pc’s to the server. We had to rely on the generator, as there was no electricity to the lab while we were there, but apart from running out of fuel once, it was not a problem. Our last shipment provided the Red Cross with a printer, a new wheelchair for one of the volunteers who has been with the Red Cross for quite a few years in Soma, also supplies of clothing, blankets, dressings and stationary were delivered. We like to help where we can as these 20 very dedicated volunteers do such amazing work under the guidance and encouragement of Momodou the Branch Officer and Mustopha the Regional Chairman. 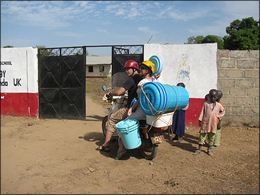 In March a large amount of supplies were delivered again to the hospital. 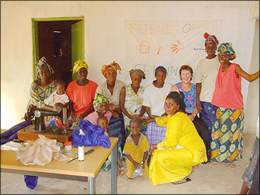 The charity was on the National radio news a few days later, which also mentioned the good work that Sankung does on behalf of the charity for his people in the Lower River Division area of Gambia. We have since sent another shipment of supplies to the hospital, which have now been delivered, including a sterilising machine. Nine of the doors in the hospital have now been replaced with metal ones with locks, and a further five have been repaired. This has made a huge difference to the hospital making it much more secure. Richard has done some work on the PC’s we installed a couple of years ago, updating and improving them, the staff were very pleased! The allotments continue to successfully produce many types of crops. Two corners of the gardens are currently being expanded and an extra well has been dug. Repairs to the roof of the toilet block and stores has been completed. In September this year a piece of land was purchased in Busumbala, which is about 45 minutes drive by local transport to the coast. We are going to build a compound on this land to provide Sankung our project manager and his family a permanent home. At the moment they are staying temporarily with relatives as they have no-where else to live. Sankung works very hard for the charity and his people and needs to travel frequently between the coastal area and up country to be able to do his work. So we are going to build this compound, and include 3 spare rooms for any of our sponsored students who need to move temporarily to the coastal area to further their education.